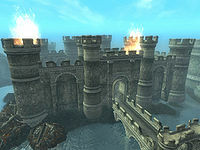 Kvatch Castle is at the northwestern end of Kvatch, surrounded by a moat. Before the Oblivion Crisis, it was the seat of the Count of Kvatch, Count Ormellius Goldwine. 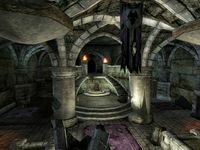 It now lies in ruin thanks to the devastation wrought by the Daedric Siege Crawler in the first moments of the crisis; many daedra remain among its ruins. 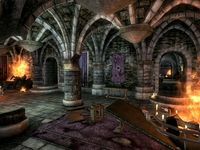 Savlian Matius will request that you help him retake the castle and find the count during an optional part of the main quest. 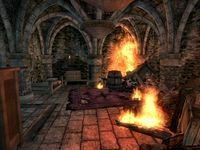 Savlian will permanently stay in Castle Kvatch after the quest, along with the surviving soldiers. He mentions that they will rebuild, although no reparations occur. The castle's Great Hall is divided into two separate cells. The second leads through to the Dining Hall, the Sleeping Quarters, and the Count's Quarters. An underground Passageway also connects an exterior portion of the castle's keep to a tower outside the moat. 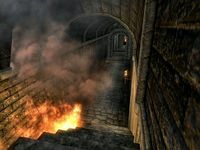 The interior of the Great Hall is destroyed, as is the rest of the castle; fires burn in random places, and the supporting foundation of the building is broken and crumbling. Opposite the entrance, at the northwest end of the room, the throne sits against a wall, with the door to the second part of the Great Hall above and behind it. This section of the great hall is a long passageway stretching from the southeast to the northwest. There are two hallways on each side and a fifth at the end. In the eastern corner, beside the entrance, two bottles of Surilie Brothers Wine and a bottle of cheap wine lie on the floor, with a second bottle of cheap wine on the counter against the wall, and a bottle of Tamika's West Weald Wine lies behind the wine rack leaning against the wall. The table on the wall here holds a copy of the skill book A Dance in Fire, v4. A cupboard next to this table contains clutter, and the doorway next to it leads into a long and relatively empty hallway which is collapsed at the end. The hallway opposite this one holds three clutter barrels and a fourth containing food. The five crates also contain clutter, as does the chest beside the bookshelf. Scattered about the hall are four clutter sacks, a fifth sack with food, an orange, a pumpkin, a loaf of bread, and a head of lettuce. The door at the end of this hall leads into the dining hall. The second hallway on this side of the room, in the western corner, is also relatively bare, and curves around to a collapsed dead end. The hallway opposite this contains training equipment and a bookshelf that holds a variety of clothing and armor: a coarse linen shirt, huntsman leather pants, chainmail boots and helmet, leather boots and greaves, and fur gauntlets. The door next to the shelves leads to the sleeping quarters. The hallway at the end of the entrance room is partially collapsed at the bend. Here, a chest of drawers contains clutter and a cupboard holds drinks. The doorway at the end leads to the Count's quarters. The dining hall is destroyed like everything else. In the northern corner, a loaf of bread, a tomato, an apple, and two carrots sit on the table, with a third carrot on the floor. A cupboard containing drinks lies in a burning pile of rubble in the western corner. A bottle of Tamika's West Weald Wine sits on a stool on the southwest wall, and another bottle sits next to a bottle of Surilie Brothers Wine on top of the wine rack in the eastern corner. The barrel beside the wine rack contains clutter, as does the tied sack. The other two barrels in this corner and the untied sack hold food. In the sleeping quarters, a single bed lies against the wall on each side of the door. The chest next to the bed in the western corner holds clutter, as does the cupboard in the burning pile of rubble in the eastern corner. 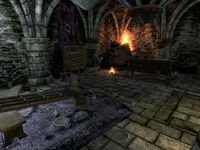 In the entrance of the Count's quarters, on the desk in the southern corner next to a map of Kvatch, two strawberries and an orange sit in a bowl. In the eastern corner, a chest of drawers containing clutter holds a bottle of Tamika Vintage 399 on top and a bottle of Tamika's West Weald Wine floor beside it. The display case is empty. The chest of drawers in the northern corner also holds clutter. The next room is the Count's bedroom, where his body can be found in the western corner in front of a clothing cupboard. A chest in the burning pile of rubble in the northern corner contains clutter. The double bed sits against the northeast wall, and a bottle of Surilie Brothers Wine sits on a stool in the eastern corner. The chest and chest of drawers in the southern corner both hold clutter, and three pieces of gold sit on top of the chest, with a fourth on the floor next to it. Three bottles of wine lie on the floor; one of cheap wine, one of Tamika's West Weald Wine, and one of Surilie Brothers Wine. The passageway begins with a trap door in the exterior of the castle between the two gates at the entrance. The long underground hallway leads to a tower outside the moat, where six crates, four sacks, two barrels, and a chest all contain clutter, while a third barrel contains food. This page was last modified on 8 July 2018, at 15:24.